The Triad Volume XXXVIII proudly presents the magnificent works of our ambitious students and the contributors to Hillsborough Community College. With works of surrealism, abstract art, and ideas of light versus darkness, we convey the irony of fantasy that converts into reality, and the very sense of being misunderstood becomes understandable. In our constantly changing world, and with history repeating itself and evolving at the same time, the art of war becomes apparent in ways we never could have imagined, Volume XXXVII was destined to be a looking glass into ironies of our reality without being political. Here, the world is simply understood by the artistic eye. As we chose our content, we thought about how it might portray the Triad as a whole in order to capture the mood of our society. I imagine it will spark various outlooks on the works just as we all generate our own outlooks on life. 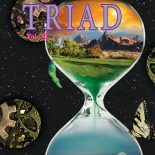 This entry was posted on October 20, 2017 by hcctriadme in Table of Contents.